Garrett West, a University of Oregon senior from Medford, made things personal when he testified before a legislative subcommittee this month in favor of bond funding for the renovation of Chapman Hall. 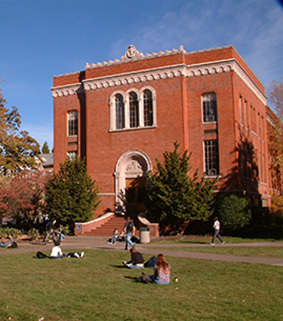 West is a student in the UO's Robert D. Clark Honors College, which he called "one of Oregon's crown jewels." He is president of the Clark Honors College Student Association and, as a native Oregonian, speaks for the "best and brightest" that he said the UO is competing to keep in-state for their post-secondary studies. He's also close enough to the honors college to be well aware that its 75-year-old home, Chapman Hall, lack outlets for students to plug in laptops and other devices for group studies and collaboration on projects. Chapman lacks even an interior staircase to connect its ground floor with its upper floors. "It is used by over 1,900 students daily from the honors college and beyond, but it has received few upgrades since its construction under President Roosevelt's administration," West told members of the Joint Ways and Means Subcommittee on Capital Construction during a Valentine's Day hearing. "To state the problem clearly, it does not meet the standards of preparing students for 21st century jobs," West said. A total of 21 alumni and five students have written letters to legislators in support of the Chapman project, which requires approval of $7 million in general obligation bond funding - $2.5 million that requires a match and $4.5 million that's focused on maintenance and requires no match. The balance of the $9.5 million deferred maintenance and renovation project will be covered by donors and matches from other funding sources. The Chapman project and a proposal for $2.1 million in bonds to repair a UO utility tunnel are among eight capital construction projects for higher education that are currently being considered by legislators. West and Chris Ramey, the UO's associate vice president for campus planning and real estate, testified in support of the UO projects at this month's subcommittee meeting. "Funding is needed to address the staggering list of worn out and failing systems (at Chapman) – windows, heating and ventilation, electrical and plumbing systems all need to be repaired or replaced," Ramey told legislators. "The repairs would also address the building’s seismic issues, energy efficiency, safety and ADA accessibility." Chapman Hall has remained essentially untouched since it was built in 1939. It's been estimated that 21 percent of the building’s systems need repair or replacement. The project will begin in early 2015 if funding is approved, and will create 86 jobs. The tunnel project is to address issues with the UO's Franklin Utility Tunnel, one of two tunnels that connect campus to its main power plant. The tunnel runs beneath Franklin Boulevard, and an independent engineering firm concluded last year that problems must be addressed soon to avoid potential structural failure or collapse, which would interrupt utility services to half of the UO campus.